House TTN was designed to accommodate three families – the parents and the families of their two daughters. They had decided to live together again with the birth of grandchildren. 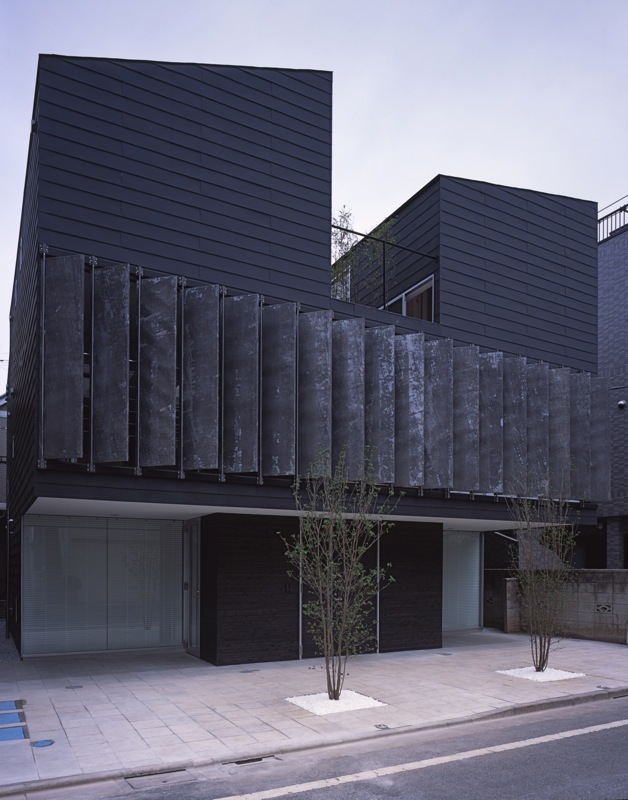 The site is located in Shibamata of Katsushika Ward, a historically downtown part of Tokyo. Though the neighbourhood is usually associated with the image of unplanned streets and alleyways running in a disorderly manner, the house is situated in a carefully zoned residential area. Even so, as properties are being passed down from one generation to another, they are being broken up into smaller segments. Therefore, small and narrow houses are starting to emerge everywhere. The first request for this project was to have a sort of collective residence to accommodate three homes, a plan which would completely separate the families within the same building. However, after much thought on how to maximize convenience, effective and rational use of the site, and the pleasure of each other’s company, House TTN decided to take a semi-independent, sharing approach. In order to have more than one nuclear family live together as one, it is essential to secure a comfortable distance within the design. Thus, each family has their own independent kitchen unit, bathroom, and toilet, but the homes are adjoined through the ground floor area and common deck – inside and out. The parents’ living space is located on the ground floor, with a highly independent main room and private rooms (one Japanese-style room and one bedroom) opening towards the outside. The main room is shared by all three families, and the private rooms serve as “gates” that connect with the surrounding community. The first and second floors are divided east and west, creating living spaces for each daughter’s family. Outdoor common decks in between the two sides of each floor serve as both converging points and buffer space. Transparent glass and sudare or Japanese wooden blinds are used on the common decks to separate the families but at the same time avoid complete privacy. It is possible for each family to go about their business independently, but these purposefully built common areas make it possible to achieve a higher quality of life. A comfortable distance is achieved by softly compelling the families to come together. Another important aspect of House TTN was its structure. As the decision had been taken not to separate the homes completely, the residents wished to retain an option that would enable them to cut the building in half, left and right, in case they wished to do so in the future. In order to make this possible, the two sides of the structure including the foundation are completely independent of each other, and designed to guarantee durability after being divided. Of course, if two new separate buildings were to emerge, they would both need to pass the various building regulations. Therefore, this aspect greatly influenced the initial plan and form of House TTN. However, it may also be said that because of this requirement, it was possible to achieve a bold design, shaping the areas that would be removed if the house were to be divided into outdoor common decks. It is unclear whether this option will be taken in the future, but having an alternative will surely encourage friendly and active communication between the families. House TTN thus provides the necessary functions for an “urban” extended family, accommodating the needs of modern nuclear families who have grown accustomed to independent life but have chosen to enjoy the benefits of being part of a large family.